Came across this while pounding through the Reader today. It is a book on the graphic design of race cars by Sven Voelker. Most people don’t know that racing cars from the likes of Porsche and Ferrari were given their looks not by marketing strategists or designers, but by chance. Go Faster is a collection of over one hundred examples of racecar design that documents the carefree anarchy in which they were created. 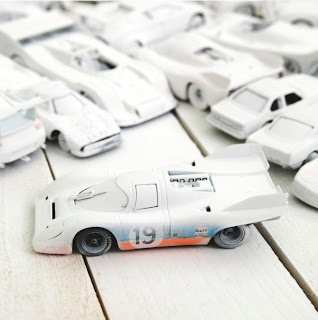 In the book, each colorful racing car is featured next to a blank, white model. Thanks to this juxtaposition, Go Faster shows its readers exactly how graphics modulate the look of the vehicle. The neutral models also give readers ample opportunity to imagine their own possibilities for graphic design in motor sports. Damn, if that isn't in my wheelhouse! Back in the day, I was mesmerized by these cars and their design. The Gulf Porsches? C'mon! I could stare for hours at pictures of them as a kid (magazines were my internet). The book looks so cool that I made my way over to Amazon and ordered up a copy (not a bad price either). This looks is gonna look good on the coffee table. Note: I am starting a Christmas hint tag so that certain people that complain that they can't find anything for me, can have a few clues to what might make a cool gift.